The types of foundations that you will find on Maui break down into two major categories. The first type you will find is the most common for new construction and is called slab on grade. A house with this type of foundation will have a lower profile with only a small portion of the slab exposed at the bottom of the exterior walls. This foundation is a large concrete slab poured in place with all of the plumbing under the slab. There is rebar (metal re-enforcement bars) spaced evenly throughout the slab and a plastic sheet across the bottom acts as a vapor barrier. Improperly compacted soil under the slab which will cause excessive cracking and settling. Poor drainage around the home is another cause of excessive settling. Another common foundation system that has been used on the island for many years is the foundation block and post system. A home with this type of foundation will have a higher profile than the slab on grade homes and will usually have horizontal wood slats at the bottom of the walls. These foundations consist of several concrete foundation blocks (typically 16" x 16 " x 6") that are placed into the soil and used as pads to support the wood posts that support the beams that support the rest of the home. 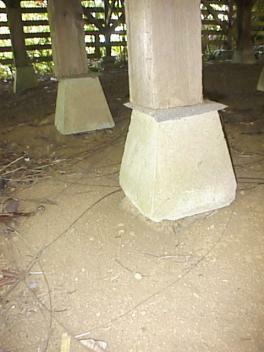 Termite shields (metal plates) between the wood and concrete minimize the chance of termite infestation and cross bracing provides lateral support from the pillar to post. The most common defects with these foundations are caused by soil erosion which can undermine the foundation block. Another common defect is inadequate bracing at the posts.